The Legislature’s Joint Finance Committee announced six public hearings on Governor Scott Walker’s 2017-19 biennial budget proposal. None are in the Madison area, but one will be held at UW-Platteville on Monday, April 3 from 10 am until 5 pm. PROFS hosted a public forum on the state budget on Thursday, March 16. PROFS President Judith Burstyn moderated. State Representative Jim Steineke (R-Kaukauna), Assistant Vice Chancellor for Government Relations and Strategic Partnerships Ben Miller, and PROFS Legislative Representative Jack O’Meara were panelists. 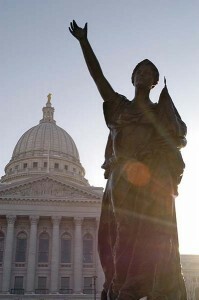 The University of Wisconsin System Board of Regents is meeting in Madison today, March 9. All meetings will be held in Gordon Dining and Event Center, 770 West Dayton Street. Livestream coverage of the full board meeting is here. The Subcommittee on Investments and Committee on Education will meet before the full board begins at 9:30 am. The education committee will consider the post-tenure review policies of UW-Extension, UW-Parkside and UW-Stout. The full board will hear updates from UW System President Ray Cross and Board of Regents President Regina Millner. Michael Crow, President of Arizona State University, will lead a discussion on public higher education and Susan Baxter, Executive Director of the California State University Program for Education and Research in Biotechnology, will discuss Cal State’s system-wide biotechnology efforts. The Legislative Fiscal Bureau released its summary of Governor Scott Walker’s 2017-19 state budget proposal. State agency briefings on the budget are expected later this month, with public hearings expected in April.